The time to reflect is now. ‘Circle Mirror Transformation’ by Annie Baker is a perfectly titled script. An incredible look into the growth that can come from people coming together and reflecting (sometimes through the protection of silly games or exercises), this production at The Bluebarn was practically flawless from start to finish. The moment I walked into the theater, I knew that I was in for a different kind of experience. I sat in the audience, facing a stage made to mimic a dance studio, looking into a wall of mirrors that reflected the audience. The design, by Marty Marchittoz, immediately made me a part of the space, a part of the tale. And throughout the show, I was reflected not just literally, but on a deeper level, too. The story follows four students taking a theater class at a community center led by teacher, Marty (brilliantly played by Susie Baer Collins). The students range in age from sixteen to seventy, and each character is perfectly unique, flawed and beautiful. We only ever see them within the confines of the classroom over the course of the month-long class. We get to watch as the strangers form relationships, and bonds that are naturally created from being present and vulnerable. With a show that spans over the course of four weeks, I felt like I was truly able to get to know these characters. However, it took me a while to adjust to the numerous blackouts. They weren’t as distracting, though, when accompanied by Craig Marsh’s sound design. While it took some time for me to be captivated by this production, after a few scenes, I was all in. This was a fairly easy task considering the immensely talented cast. Nils Halaand (Schultz) and Ashley Kobza (Theresa) had a knack for the perfectly, and sometimes painfully realistic dialogue. Susie Baer Collins shone in the veiled emotional moments, especially when interacting with her husband James (played by Mike Markey). Caroline Friend (Lauren), was so impeccably subtle that I forgot I was watching an actor. In fact, that was one of the most notable parts of this production. Each actor brought a raw honesty to the characters, and I was, frankly, blown away. To add to the brilliant performances, Susan Clement Toberer crafted a wonderful flow, and realism. It was so compelling that the theater began to fade, and I was simply sitting in a classroom, watching humans interacting. Especially now, amid the chaos of current events, I believe this is an incredibly important piece of theater. It speaks to the human condition at the core, past all the opinions and politics that get in our way. If you want a night of art that will remind you why you feel the need to connect, that will make you laugh, and will touch you deeply, then RUN to the Bluebarn and get tickets. When you get to the show, take a deep breath before you walk in and leave all your baggage at the door. Let this brilliant team take you on a ride, and enjoy a night of purely lovely theater. 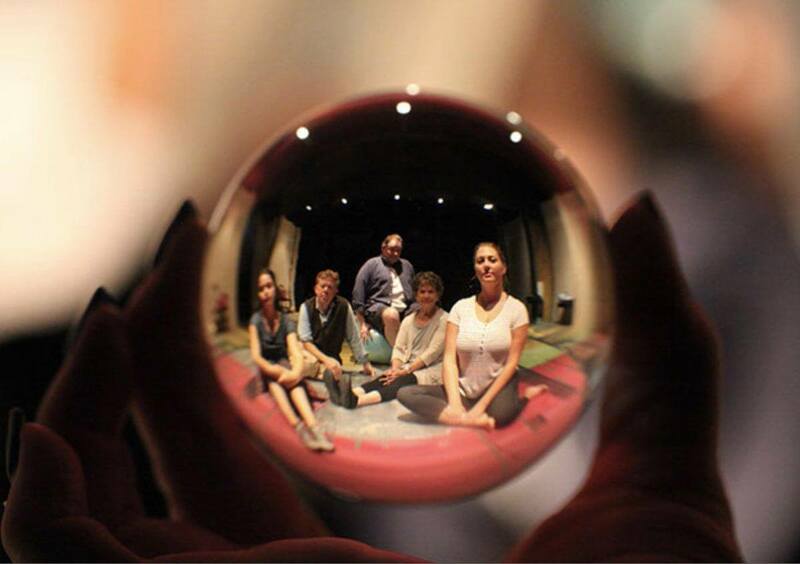 Circle Mirror Transformation by Annie Baker runs through October 21st.